Los Tocinos, Cubilla, La Borbolla, Cueva del Toyu, Tinganón, numerous drone flights. Click on, or tap any image thumbnail for a full-size version, or on a video clip to play at a larger size. 09.05 Uneventful flights to Bilbao. An hour to collect the car because it wasn’t ready, plus a leisurely lunch in Durango, meant we missed the chance to visit the Gesaltza showcave we’d planned – by a few minutes. 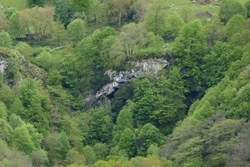 Did view the valley above with the sink for the cave, and later the Balzola cave limestone on the way to Castro Urdiales. A lot of driving by Bill, but we arrived in Castro within a minute of the planned time. La Marinera for a light supper. 10.05 Breakfast in the ‘green bar’ 150m down the road (Verivan). 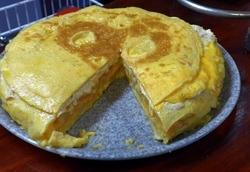 Omelette & ham in a bread roll for Mike and a delicious bonito tortilla for Bill. Then off to Oriñón before our free parking expired at 10:00. An overcast day. The map showed a stream originating at the foot of the hillside and there was indeed a wet resurgence Δ and above, across the track, another entrance with dry passage which was followed for 5m to a minor squeeze. Beyond the squeeze the passage opened out into a large chamber but was not pursued. Then drove west and south to Ampuero and towards Cueva Los Tocinos. Surprised a dozen huge vultures feasting on a dead goat next to the road. Above a mud-choked sink in Hoyo Mena Δ (obvious on map) there was a small cave Δ with a chamber 5m across. It was more than a rockshelter (with real stal) but no ongoing passage. Los Tocinos itself Δ was hard to find, but is a large entrance steeply descending into a big passage 20m high and 30m wide. Into the muddy floor someone had cut mud steps to aid descent but the mud was damp and slippery and we decided not to risk sliding down. The muddy ramps and large chamber were reminiscent of Pozo del Infierno. Good echo! A satisfactory morning with 3 entrances found deserved a satisfactory lunch which we eventually found at Restaurante Casanova, in Arredondo. No men� del d�a but we were hungry. Only 1 portion of cabrito was left which we correctly guessed would be huge so we shared it with a bottle of Navarette Rioja (Crianza 2014). A very good lunch for just EUR 30! We then proceeded south until the As�n waterfall and then up and along the unpaved track (off limits to vehicles) towards the presumed sink. 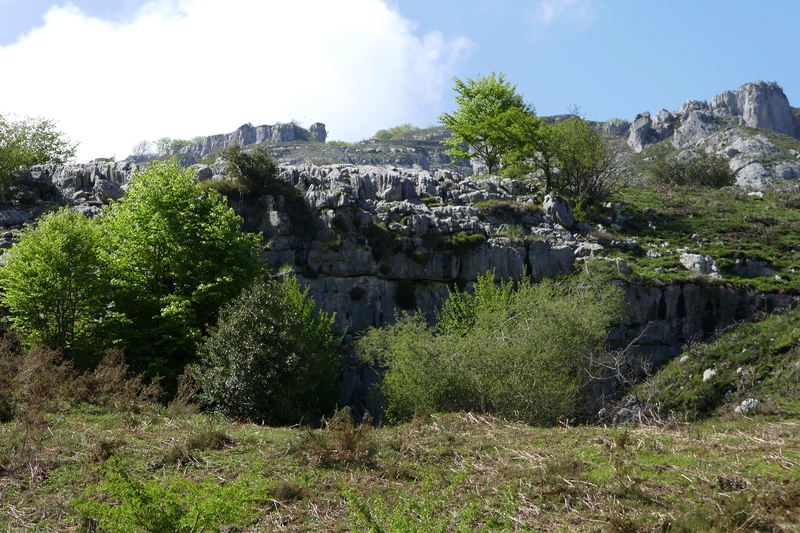 Stunning views of limestone peaks, green turf, and depressions but no caves. 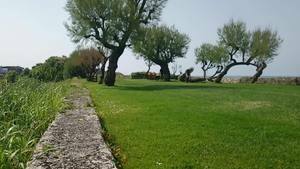 Blissfully quiet with just the whisper of wind in the grass and birdsong. Eventually a stream was found, sinking in the mud. Drove back via Las Colladas and stopped for refreshment in Ramales de la Victoria reaching Castro Urdiales at 19:30. Bocartes under the arches. 11.05 Breakfast at the green bar, then off to Cueva de Cubilla. The old route down from the track was muddy and overgrown, so we decided to carry on and find a different track that we thought we had seen. After a while we found a plausible cow track down to the stream, and some slippery stepping stones over. The path on the other side ended at a cliff so we then climbed high above the stream and back down again to cross the raging torrent a second time, this time with a welcome, if unstable, overhanging tree branch to help. Finally back on the good grassy path we remembered, we soon arrived at the cave. Our intent, however, was not so much caving as flying, and we used the drone to take various panoramas and stills. 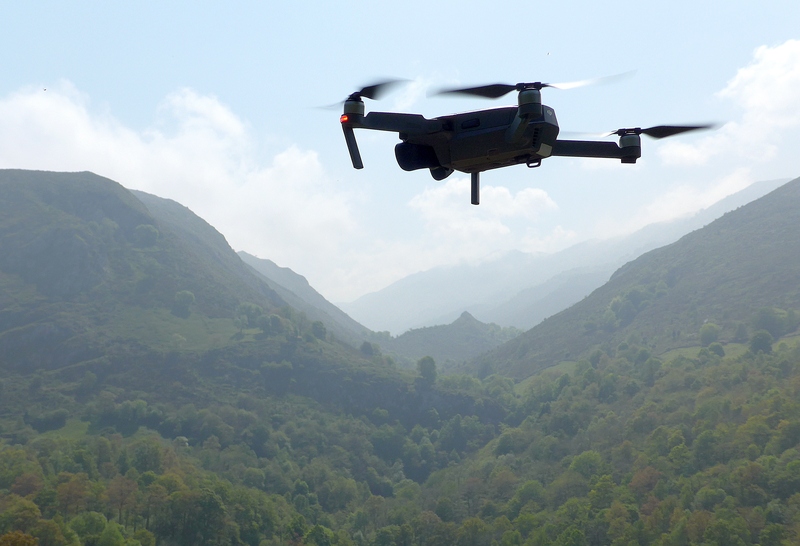 Flying the drone was more demanding than usual because only at +25m was a GPS signal achieved, and the panoramas we wanted were lower and close to the cave entrance, so manual skills and the aid of a spotter were essential. 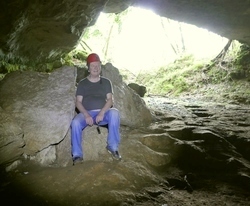 Pictures ‘in the can’ (SD card), we wandered into the cave, Bill going out of daylight. 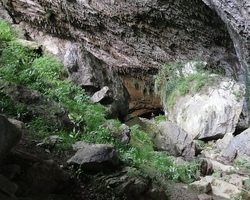 The cliff face above the cave was dripping water after the wet weather making the entrance floor muddy, but deeper inside it became hard mud – quite a pleasure to walk on – and the ceiling was generally high. On the left the main passage descended and we could hear the streamway re-emerging and on the right the passage continued to the higher levels that OUCC had not surveyed in 1966. 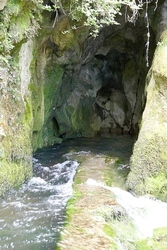 Incidentally, the Cubilla system has now been connected with Cueva de Llastrilla (Sangazo) where the stream re-emerges. A real pleasure to revisit a “big” cave. Afterwards we found a good new path which led directly to where we’d parked the car – a flat area mostly filled by goats Δ; the path starts next to/behind the signboard for the cave. It now being just after noon, we had a couple of hours to kill before lunch: a refreshment stop in S�mano, then west past Oriñ�n to near Ermita de San Juli�n to view the sea and the limestone. Then wandered around straggling villages to Rte. Ambigu in Hazas but didn’t fancy it for lunch. Tried various villages as far south as El Puente, but eventually returned to the Meson in S�mano (busy and very noisy) for a passable lunch. A walk along the Castro seafront in the afternoon. The hunt for evening meal did not end well; the ‘best of the bunch’ had edible paella, but neither of us could finish the tasteless escalope de lomo despite being quite hungry. After breakfast at the green bar we returned to pick up bags and take leave of María José our unobtrusive Airbnb landlady (she subsequently reviewed us online as “agreeable and polite”). Travelling west we decided to search for the resurgence of the Cueva del Toyu system which we had not seen since 1986. The direct approach of descending the damp meadow brought us to a very steep, slippery and muddy bank – with no paths. So we drove over to the other side of the river and walked along a track (plan B) but there was no sign of the resurgence (it should have been very evident in wet weather, but was hidden by trees). Lunch at Casa Gloria in Camijanes, where all the staff welcomed us. Cold grilled vegetables for Bill followed by abundant but tough beef and chips. Cocido montañés and filete de ternera for Mike. Back to Llanes via Posada and refreshment in the Corner Bar as our favourite watering hole was closed for renovations. A light dinner in ‘El Almacén’ in Llanes of boletus (fungi) con picón for Bill, and a vast plate of costillas for Mike. 13.05 ‘Changeable’ weather was forecast, and indeed it was, starting with rain – so a quick dash across the road for coffee was in order, followed by the usual plan in time of wet: head south. In due course we were enjoying picón cheese in La Hermida. Next, the plan was to drive to the col (Collado de la Hoya) above Bejes to check out the limestone above the cliff-face caves we explored with the drone last year (see video clips). This took much longer than expected, however, as a herd of cows lumbered onto the road just as we approached Bejes, heading up to the same col. We stopped many times to take in the stunning view, take photos, etc., and also got to admire at length (and at height) the 250+m sheer drop from the unfenced road to the village. Eventually reached the top; the track NE was very pretty (with views across to Tresviso) but speleologically uninteresting. Back down to La Hermida for a pleasant lunch of soups and lomo. After lunch we headed north to Suarias to investigate the source of the water that sinks in the big depression (Corvera) W of Cabañuca. We were expecting some serious ‘jungle bashing’ in the heavily-wooded valley, but instead chanced upon a clear track that contoured round to a small waterworks blockhouse Δ with 50m or more of rocks, gushing with water, beyond. We guess that the origin of the water is Valmayor, 1.5km SSW and 260m higher. Back to a rainy Llanes for dinner, after the (mostly) dry day to the south. 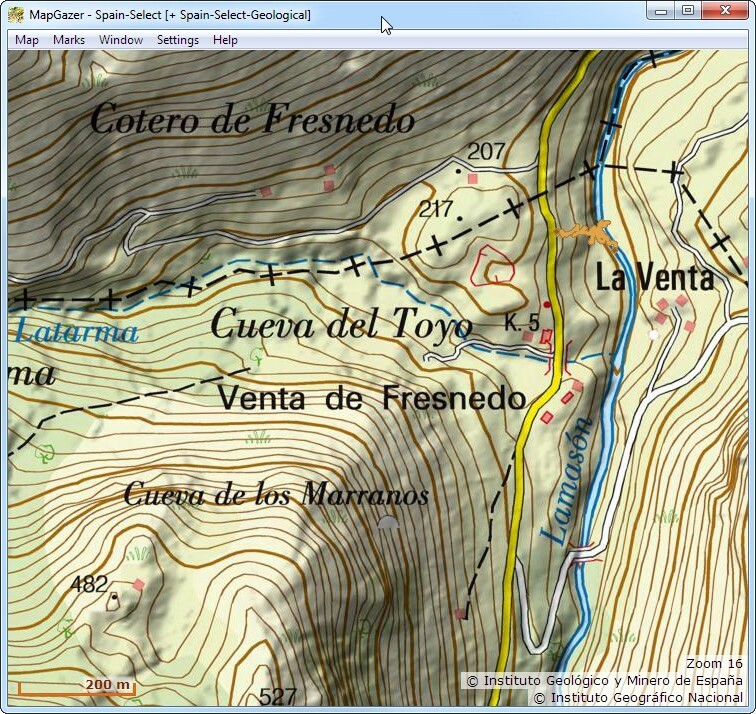 14.05 A wet start with a cloudbase of under 150m, but with forecast of a fine(r) afternoon, south via Posada to Mestas de Con. After checking the menú (which turned out to be from the day before) at Casa María, we filled in time before lunch with a thorough exploration of the village. The ‘Gastrobar’ San Martin might be worth a visit when (a) open and (b) the sun is shining. After lunch the sun was starting to be seen through the clouds so we drove up to El Mazuco and hiked around to above Boriza with the drone. It was a bit gusty, but the drone handled it well and we took three panos of the suspected cave, from various distances. 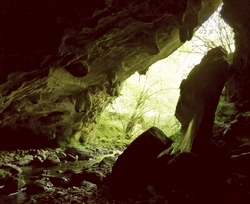 Nice panos, but not close enough to be conclusive (and the cave itself was underexposed). 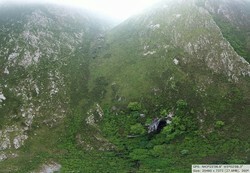 The second flight was for a very high level pano of an interesting cliff face – came out well. Both flights a hand-catch ‘landing’ and useful experience. Back to Llanes for a ‘light’ supper of tabla de quesos Asturianos. A lovely sunny morning with an excellent view of the Sierra de Cuera. Breakfast at cafetería ‘Bitacora’ then off east to the village of La Borbolla to look for (and measure GPS coordinates of: Δ) the resurgence cave found and partially explored by OUCC 45 years ago. 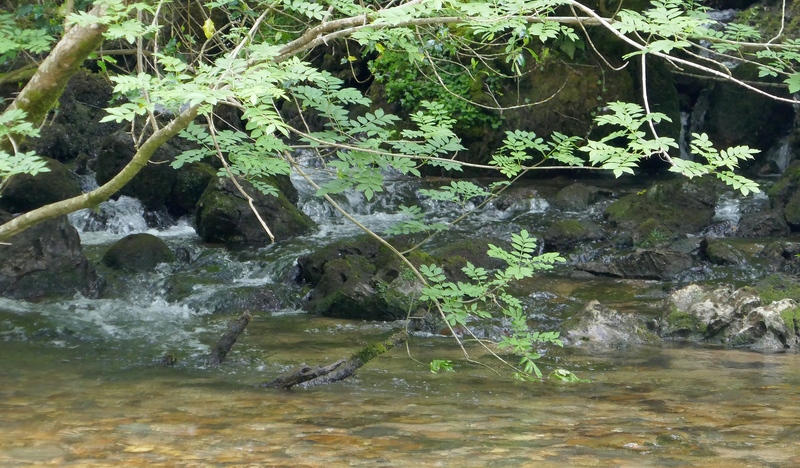 The resurgence is known today as the Nacimiento del Río Cabras and its flow is quite considerable. Indeed, in times past, the water power was used to drive three mills. OUCC also claimed to have found a high level entrance but we were unable to locate this despite walking for some 100 minutes. We then drove to Colombres in search of lunch but the two open restaurants did not inspire. So we continued east to Casa Gloria, Camijanes for EUR 12 menus. Mike had excellent lubina (sea bass) a la espalda (butterflied). After lunch we drove south to the Lamasón valley to try yet another time to find the resurgence for the Toyu cave system (that we had explored in 1982). A route down to the river starting further north took us to river level fairly successfully (plan D) but progress up-river became difficult at a rocky platform. 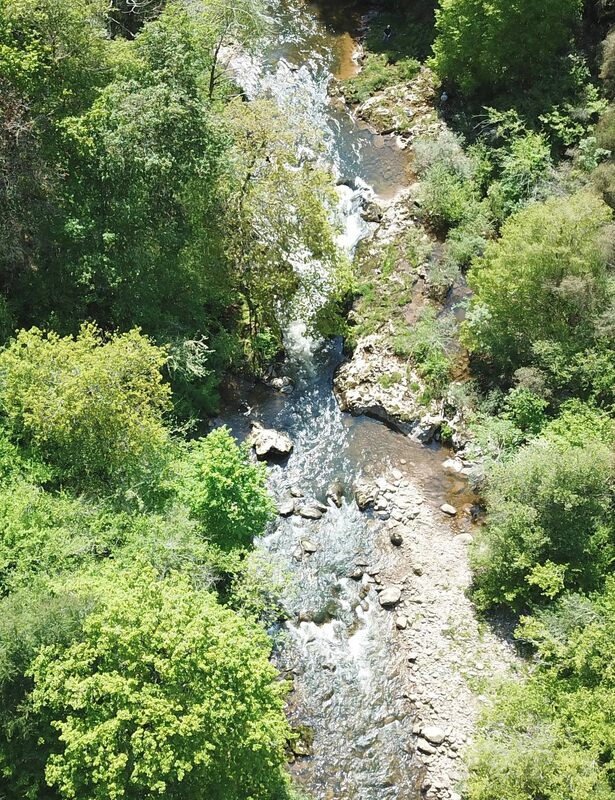 From there we launched the drone (plan E) on an 11 minute flight following the river upstream. Alas, subsequent perusal of the photos did not reveal any hint of the resurgence location! 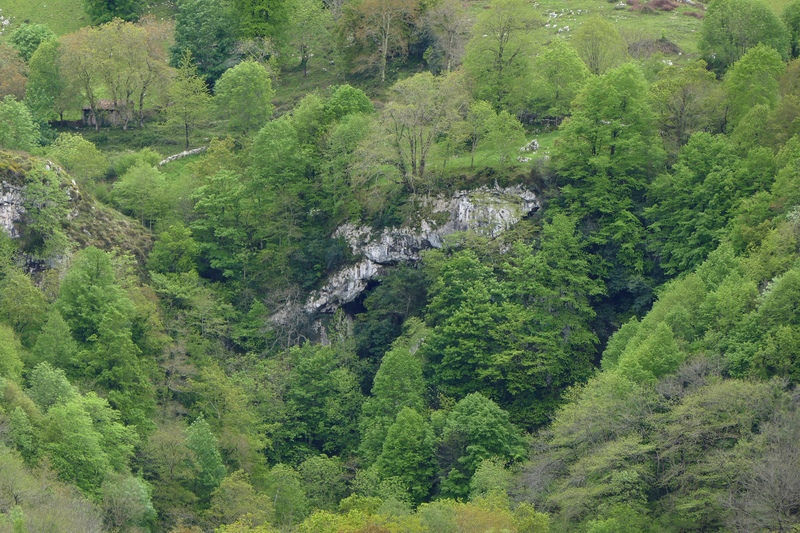 It is likely hidden below trees. Plans F and G were hatched for a later visit. 16.05 An overcast day, suitable for walking. We wanted to check out a route to possible resurgences of the Pozo de Vega el Forcau in the western massif of the Picos. 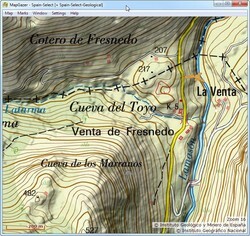 In particular the electronic map suggested that there was a major obstacle, almost a cliff, on the southern side of the depression marked ‘La Meona’ 600m SW of Lago de la Ercina. Reconnaissance showed the depression becomes a lake in wet weather and in dryer weather its flat bottom is rather boggy. The lake is filled by a stream or two. There were many cow tracks around the depression but none appeared to go south. 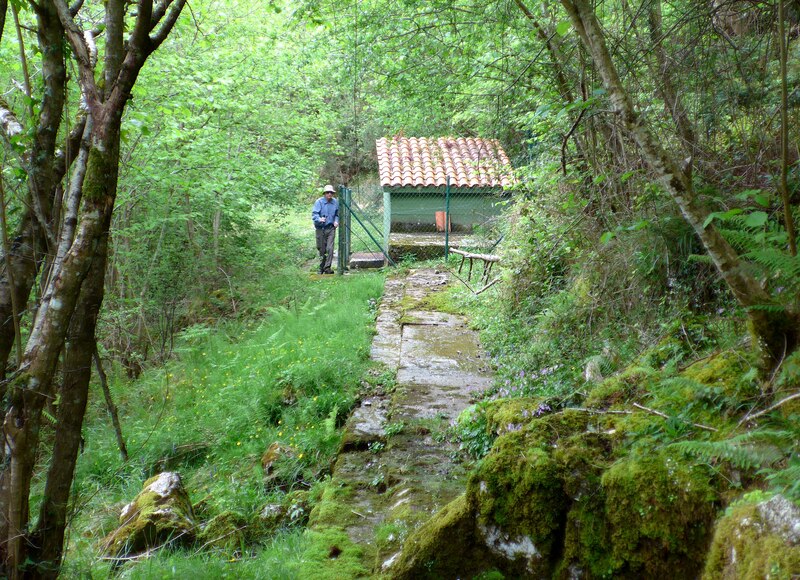 Nevertheless the direct approach to the Río Resecu valley is probably feasible if a bit steep. However, descending first into the La Meona depression is not efficient because of the loss of height (below Lago Ercina). But the scenery is beautiful. Lunch in Restaurante Orandi (below Covadonga) as it was getting late, and back to Llanes via Posada. 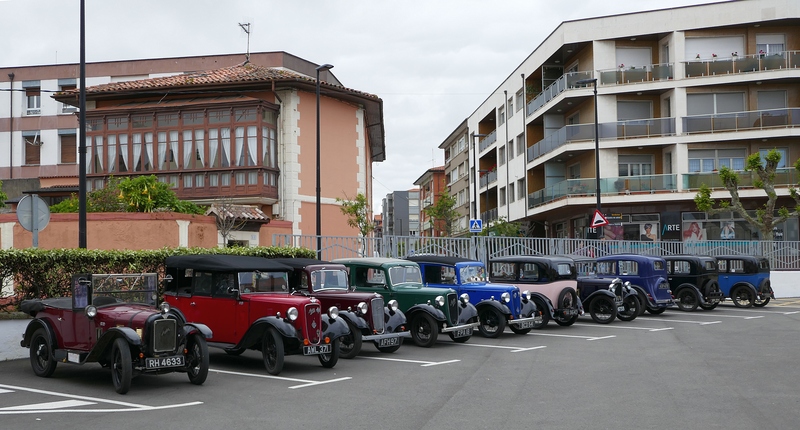 After admiring the serried ranks (at least 16) of ancient English Austin 7s of the Dorset Austin Seven Club in the hotel car park, we headed west in a third search for Cueva Rosa (the first two being in 1977 and 2002) 6km WSW of Ribadesella. After trying a couple of tracks and some field-bashing, we admitted defeat and headed for El Carmen, where Mike had spotted a cave marked on the map. Much more success this time; Cueva de Les Pedroses Δ (an important archaeological site, it seems) was close to where it was supposed to be, and we also found a rather mucky sink Δ at the bottom of its depression. 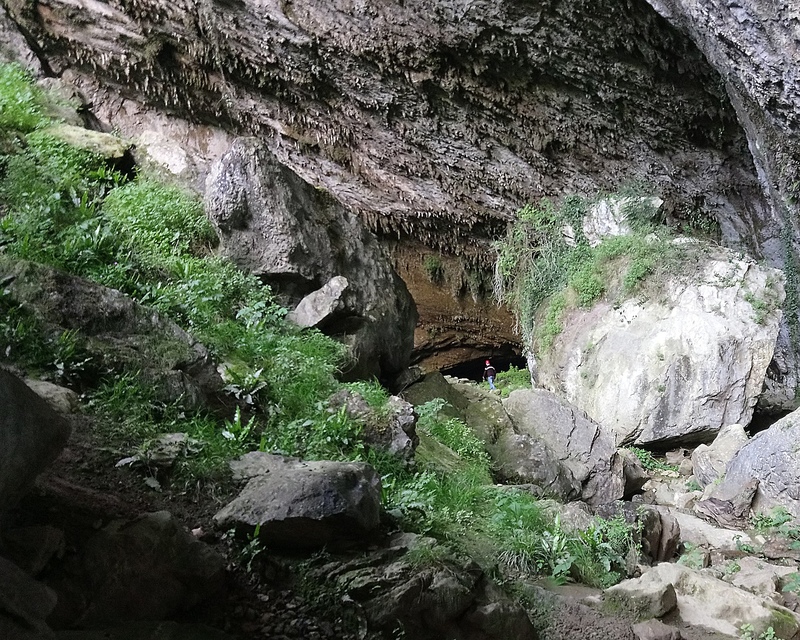 We next drove to, and through, La Cuevona de Cuevas – a cave with a road through it linking the village of Cuevas to the rest of the world. Lunch in Ribadesella, the highlight of which was a tabla de queso Gamonéu – a lightly blue cheese we’d failed to find for the 2017 ‘cheese crawl’. 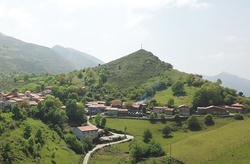 Returned to Llanes with a diversion over the Llano de los Carriles to Rales to view the limestone Collado de los Cuervos (above Samureli) from the north. In the evening we ate at the old ‘Galeon’ restaurant, now called ‘Taberna Mezcolanza’, and Mike had a dish new to us – secreto ibérico – which was an unusual cut of pork; grilled and absolutely delicious. 18.05 Our previous attempts (on 12th and 15th) had failed to relocate the large resurgence to the Toyu system draining the Latarma river. We had tried the direct approach from above first, but this failed because the left river bank in woodland was too steep – at least in wet weather. Indirect approaches from the north and south at river level (left bank) also failed, even with use of the drone. And no resurgence was visible from the track 100m above the right bank. But as the weather had been dry, we decided today to again approach the resurgence through the steep wooded bank (Plan G) hoping it would be less slippery. The plan worked – at least we came within sight and sound of running water and moss covered boulders. But if the truth be told, the difficult terrain obliged us to retreat some 25m from the actual resurgence itself, which is exactly where it appears on the Speleogroup survey of 1982. Notwithstanding this success we drove round to the right bank, walked along the same track as Saturday, but then descended the field to river level (Plan F) without obstacles. 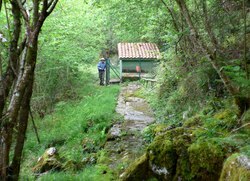 At the river we scrambled 50m N along the river in flat but overgrown woodland and the Latarma stream could then be seen entering the Río Lamasón on the opposite bank. Mission accomplished with GPS fixes bracketing the resurgence, giving Δ, we had lunch at Casa Gloria in Camijanes and then drove north to the Senda Fluvial del Nansa and walked along the hiking path to the Cofría resurgence cave which Bill entered until well out of sight of daylight. Back to Llanes and dinner at the Salero restaurant. Mike had delicious fritos de merluza (very fresh). Bill had calamares en su tinto with rice. Forecast good, and the actual weather matched, so up to El Mazuco. First to the bar to reserve a table (in the name of ‘Bil’) for lunch, then a short way along the track S of the village to fly the drone for panoramas above the Bolugo cave and of the SE aspect of the village itself. Next a hike along the track to a point above Boriza for some detailed manoevering in Tripod Mode between the cliff face and the trees to secure more pictures of the elusive ‘upper cave entrance’ we suspect. Trees below the drone meant it was not possible to get a straight-in picture, so the results were somewhat inconclusive. By now we were ready for lunch, and much enjoyed chuletillas and lomo from the grill, seated at the best table in the restaurant (front left) with its fabulous view. El Mazuco from the NE, by drone; the smoke is from the restaurant’s grill! 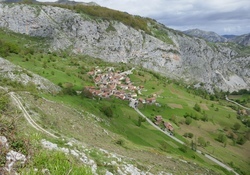 Our earlier panoramas from the SE of the village did not (could not) include the bar-restaurant so we then walked up the road E of the village to fly the drone for a variety of panoramas of the village from the NE and also some stills and videos of the limestone above the village and the Llabres peaks. After a total of almost an hour’s flying we packed away the drone and drove up to Alto de la Tornería for a walk to confirm the position of Rafa’s Cabaña Δ, first visited in 1986. Then back to Llanes for a very light supper. 20.05 The Toyu GPS location project has extended over several years, with the location of the resurgence, described above, being the third exit/entrance of the system to be fixed, and the trickiest. That only left the main river sink to be confirmed. Plan A was to walk up the track until it met the river and then follow the river down, which turned out to be impractical due to thick undergrowth. Plan C (follow the overflow from Venta de Fresnedo) proved unnecessary because Plan B (jungle-bash directly from above) proved successful Δ, with the only negatives being the inevitable scratches from brambles and a broken hiking pole. 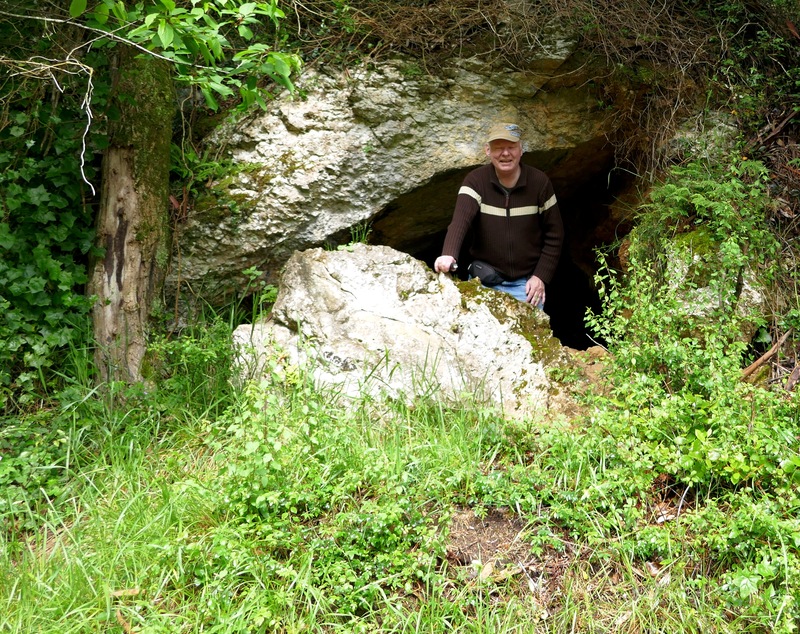 Bill enjoyed a short wade in the river, and both almost got out of sight of daylight in the cave. The weather was absolutely gorgeous again, and about 18°C (more than warm enough on the way back up through the woods from the cave!). Lunch was (for the fourth time this trip) at Casa Gloria; being Sunday, roasted cabrito was on the menu [part of the incentive to visit Toyu this day] and enjoyed by Bill, and Mike had the lubina again. Back to Llanes in due course, and another light supper (patatas al cabrales). 21.05 Had white coffees in both Llanes and Posada for breakfast and then continued west to Llovio, parking the car near the farm below Cueva del Tingan�n. This was actually in private property but the gate was wide open so we missed the sign. As we sorted out the drone a playful but respectful sheep dog picked up a large fircone in its mouth and “threw” it at us. It was clearly an invitation to play, and we both kicked the fircone a few metres and the dog would run and fetch it, and then throw it back! The dog never became annoying, never complained when we stopped playing to walk higher up the hill, but followed us respectfully. 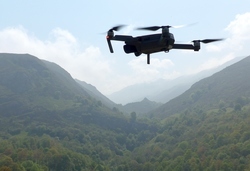 At some distance up the hill from the farm we launched the drone straight towards the saddle, following the terrain upwards, keeping it silhouetted against the low cloud (and therefore visible). But at a distance of 800 metres from us it was easy to confuse with closer birds... 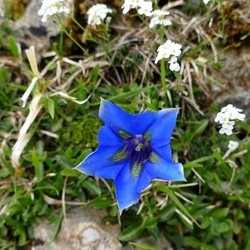 However, navigation at the altitude of the saddle was fine thanks to the video camera, and a reasonable view of the lower Tinganon entrance was seen and photographed. 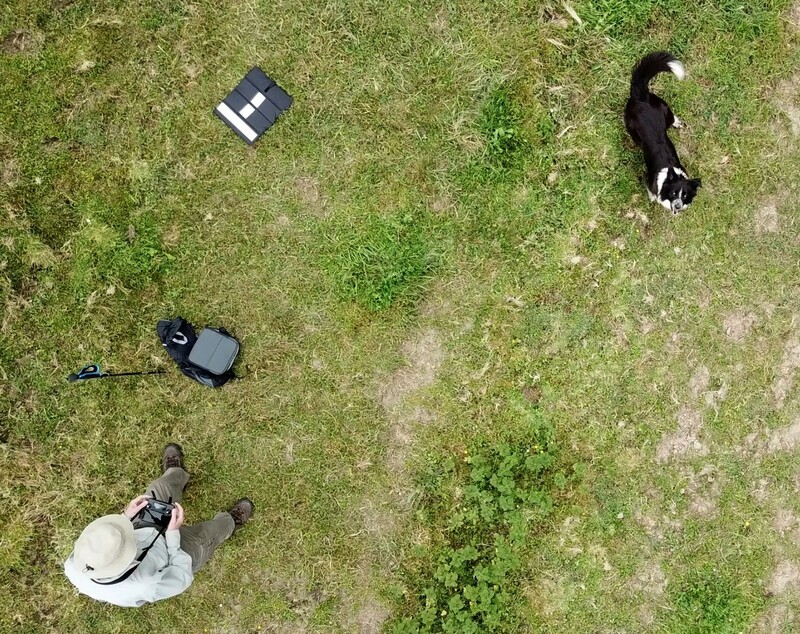 On ordering the drone home the dog got quite excited and jumped and barked (filmed by the drone, without sound). However, once Bill caught the aircraft and Mike cut the engines he went quiet! Light lunch in the sidrería Mesón el Bodegón in Ribadesella and a return to Llanes via the inland beach of Gulpiyuri (near Naves). 22.05 East to La Hermida gorge to find many roadworks one of which occupied our planned launch site and hence prevented our first objective of GPS location of Pozo del Infierno. 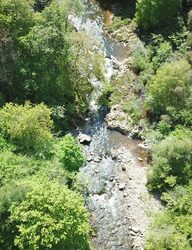 On to Bejes valley to take some drone panoramas for a PanGazer » ‘starter’ image; these look very promising (see screenshot). Next into the Bejes village itself where we found the Quesería Brañuca open; tasted picón and also goat and sheep cheese, all excellent. Bill purchased two to take home to Italy. Next objective was Potes for lunch, but this was thwarted by the main road up the gorge being completely closed just south of La Hermida. Yet again a Plan B was necessary – this time to pass some time until lunch and then eat in La Hermida. 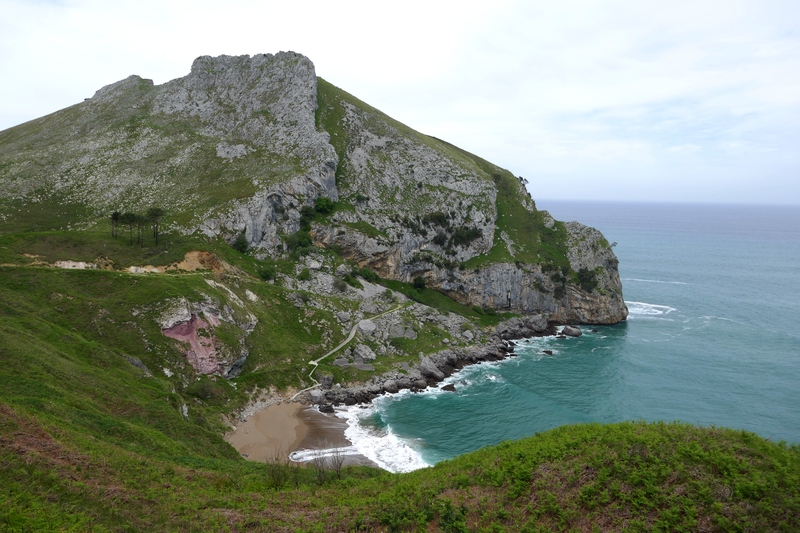 Back to Llanes to clear the car, pack, swap digital data, write the log, etc. Weather perfect again. The Expedition Dinner, to our chagrin, also ended up multi-plan. ‘Taberna Mezcolanza’ (the secreto restaurant) was closed, as was Siete Puertas. Plan C, Salero, was pleasant, however: chuletillas and tasty liver + onions. 23.05 Early start for drive to Bilbao, with a stop for coffee in Unquera. Fun with Security in Bilbao (possibly they just wanted a look at the drone) but otherwise uneventful trips home. Exchange rate: 1.14 (compared to 1.425 in 2015, 1.26 in 2016, 1.14 in 2017); 87p = 1 Euro = 166 pesetas (189 pts/GBP). Weather: somewhat cold and wet for the first few days, then essentially perfect. The drone flown was a DJI Mavic Pro »; 2hr 33min in total. Fixes and tracks were recorded using a Sony Xperia XA1 Android ’phone using the MyTrails app (or by the drone, for drone flights).